Republicans are telling voters that they’ve learned the hard lessons from the 2006 and 2008 elections and that they are back on the side of taxpayers. I’m not convinced, which is why I’ve outlined some key tests that will demonstrate whether the GOP genuinely supports limited government. o To stop bailouts for Europe’s decrepit welfare states, no more money for the International Monetary Fund. I have another item to add to this list, and it’s one that may actually go the right way. It appears that there’s a chance to end a major source of corporate welfare known as the Export-Import Bank. As the irreplaceable Tim Carney notes, a handful of Republicans are standing up for free markets over corrupt cronyism. You won’t be surprised to learn that the President wants to expand this honeypot of corporate welfare. Here’s some of what George Will wrote about Obama’s plan to divert more capital to subsidize the well-connected. This looks like a promise to compound market distortions by further politicizing credit markets, while enunciating no limiting principle. Obama is directing the bank to offer United Airlines a subsidy to match any subsidy Canada offers to persuade United to choose the Montreal-made Bombardier as United chooses between it, Boeing and Airbus. So American taxpayers will subsidize United to subsidize Boeing, which is already being subsidized in ways injurious to Delta and others. Other than self-interested companies with their snouts in the trough – and the politicians and lobbyists they finance, it is very difficult to find any legitimate argument for this cesspool of cronyism. One of the few self-professed conservatives to support the program is Hugh Hewitt, though I’m befuddled how anybody who supports corporate welfare (and Mitt Romney) can call himself a conservative. But let’s set that aside. Hewitt’s main argument is that exports are good and that the federal government should subsidize good things. If that argument sounds familiar, it’s probably because you’ve heard Barack Obama say that health insurance is good and that the federal government should subsidize good things. If you think I’m being unfair, I invite you to read the column. You’ll be especially amused by this passage. Hamilton argued for a trading empire, a robust union deploying its combined power and resources to advance the nation’s interests abroad to the benefit of its merchants and thus its people at home. Sounds reasonable, but Hewitt fails to mention that Hamilton’s view of “a robust union” did not include subsidized exports. Heck, Hewitt notes earlier in his column didn’t exist until it was created during the New Deal – about 130 years after Hamilton’s death! Besides, the Export-Import Bank doesn’t even have an impact on trade balances, as explained by my colleague Sallie James, so mercantilists are barking up the wrong tree. The Ex-Im Bank at best recreates, and at worst misallocates, private financial behavior. And to what end? The U.S. General Accounting Office (now the Government Accounting Office) has pointed out that“export promotion programs cannot produce a substantial change in the U.S. trade balance.” A country’s trade balance is driven largely by underlying macroeconomic factors, such as the ratio of savings to investment. …rather than authorizing an increase in the Ex-Im Bank’s operating bud-get, or expanding its role in the U.S. economy,Congress should recognize that the alleged justifications for the Ex-Im Bank’s existence are hollow and abolish the agency completely. Let’s also address the argument of Frank Gaffney, who normally is sensible about public policy. He makes the claim that the Export-Import bank is a profitable activity for the Treasury. the Export-Import Bank is a money-making activity for the U.S. government. According to the U.S. Chamber of Commerce, since 2005, Ex-Im loans, guarantees and insurance programs have returned $3.4 billion over and above its costs and loss reserves, with a default rate of less than 2%. That includes $400 million in 2011 alone. Since defenders of Fannie Mae and Freddie Mac made the same claims up until the eve of the financial crisis, this is not exactly a compelling claim. And deposit insurance premiums were a money-maker for the federal government prior to the Savings & Loan crisis about 20 years ago. It’s possible, of course, that the Ex-Im Bank avoids losses in the future, but that’s not the key point. The real issue is whether the allocation of capital should be distorted by government subsidies. I imagine the government could “profit” by giving sweetheart loans to selected big companies, which would allow those firms to undercut their competitors. Such a scheme might generate some revenue, but it would still undermine prosperity and foment corruption. Last but not least, don’t forget the moral component. This is a debate about whether ordinary Americans should directly and indirectly pay for a program that enriches some of the biggest companies and richest shareholders in America. 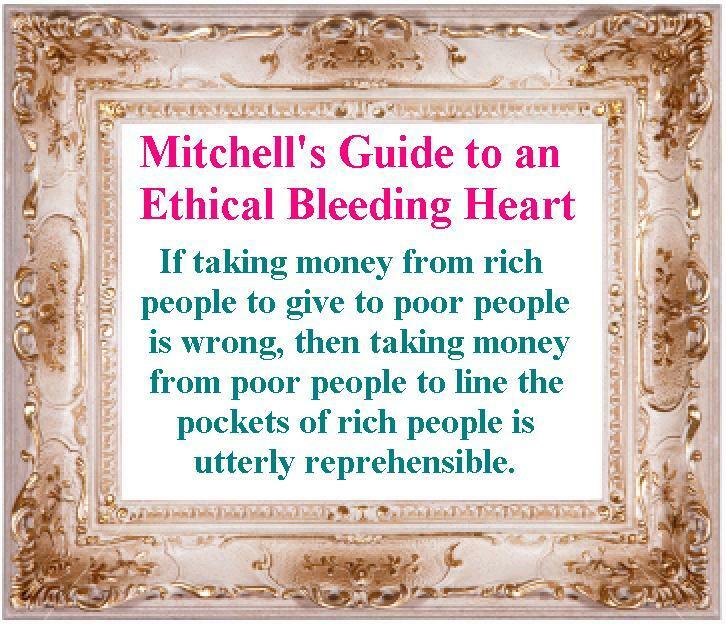 This galls me so much that I’m motivated to create another narcissistic poster (adding to Mitchell’s Law and Mitchell’s Golden Rule), which I’ll call Mitchell’s Guide to an Ethical Bleeding Heart. This is a formalized version of something I wrote when writing last year about a disgraceful welfare queen. If you did any original research instead of indiscriminately repeating unsupported claims you would learn that the companies that benefit from Eximbank financing pay all of the costs to operate the bank and pay any claims …. and at the end of the day the bank doesn’t get a cent of taxpayer money. Hey, Daniel,…..would you consider a political office or does that thought make you cringe?